Bryant C. Dunaway, was elected District Attorney General for the 13th Judicial District on August 7, 2014 and assumed the office on September 1, 2014. General Dunaway is a graduate of Tennessee Tech University and the Tennessee Law Enforcement Training Academy. Following graduation from the police academy he worked as a police officer for the City of Cookeville. He graduating with honors from the Nashville School of Law. Prior to his election, Dunaway was engaged in the private practice of law. General Dunaway is active in the community. He and his family are members of the congregation at the Collegeside Church of Christ where he serves as a deacon. He is a State of Tennessee firearms instructor; he is a Rotarian and former board member with the Rotary Club of Cookeville. 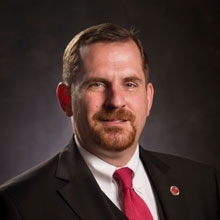 He served as chairman of the board of CityScape and currently serves as the Chairman of the Board of both the 13th Judicial District Drug and Violent Crimes Task Force and the Upper Cumberland Family Justice Center. General Dunaway is married to LeeAnn McCarter Dunaway, a native of Clay County and an RN at Cookeville Regional Medical Center. He is the father of twin daughters Katie and Julianne and a son Grant.